The most successful Deejays and entertainment minds in North America. 808 Entertainment is a DJ company serving North America. Established by world-renowned DJ Baba Kahn and partners, 808 Entertainment is borne out of the need to fill a massive void in the entertainment industry – the void of a true DJ. We believe that bringing to the fore a professional DJ with the required competencies will return the lost glory of the entertainment provided by DJs. And for three decades now, 808 Entertainment has maintained an excellent reputation of offering excellent entertainment at hundreds of events of diverse genres. From Wedding, Corporate to Private we offer all kinds of DJ services. At 808 Entertainment, we understand that corporate events require the utmost professionalism. Likewise, such gatherings should be fun while keeping the environment safe and sane. Our DJs have had the privilege of handling holiday parties, work parties, awards banquets, dinner dances, family days and workshops for local and national businesses. 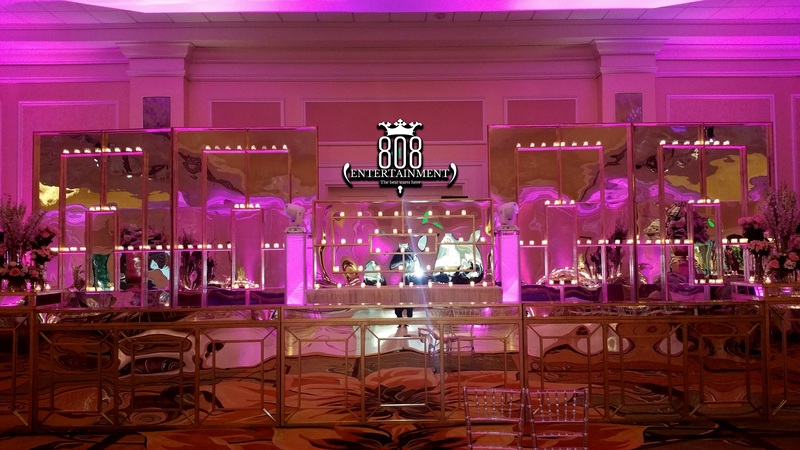 Irrespective of the genre of celebrations or commemorations your business or organization is organizing, 808 Entertainment is always on the scene to make sure your guests’ morale is maintained at an all-high. Life will not be so interesting if we leave important occasions unmarked. From individual achievements, like birthdays, anniversary, graduations, to group celebrations like a house party, club events and backyard barbeque, 808 Entertainment is capable of making any day memorable. You can count on us for national holidays like New Year’s Eve among others, and we will be there to make the day count right. With an experienced team of diverse professionals, and with a genuine passion for their crafts, 808 Entertainment is capable of transforming any setting with colors and strong sound reinforcement. We offer multi-purpose led lamps for general and specific-purpose lightning. Our multi-colored and single-colored LEDs are well-optimized to improve energy efficiency while keeping everyone safe. Whether you are interested in the big and bright booth setups, or the more reserved ones, 808 Entertainment is capable of both. Our 7 Foot Custom LED DJ booth is a modern screen designed to give your party the most incredible look possible. With excellent customizable functions, you can enjoy the view of your videos and pictures in the booth, with style and class. Let some smoke get into the party! With our party dry ice, we will help you create an epic foggy or smoky atmosphere. Fit for a memorable entrance to your wedding an birthday parties, our dry ice is completely safe and odorless, giving your photographer and videographer breath-taking moments to capture. We have over 20 years of experience providing Dhol Drummers for Weddings, Parties and Corporate Events and more. Professional, Reliable and Local Dhol players available. Live percussionist and 808 DJ service for your events and parties. Spice up your wedding entertainment with this GTA drummer and 808 DJ combo. 808 Entertainment LED Floors are designed to take your party to the next level. Apart from being perfect for weddings, proms, fashion shows and every other event, our led floors will live up to expectations by creating a great dancing atmosphere. Hurry up! Contact us today and get a booking for your next event. With over 65 years of combined experience, our foundation consists of the most successful Deejays and entertainment minds in North America, joining forces to offer you the best of the best. 5X Award Winner BEST DJ. Plays All. For the past 15 years Dj Vicious has been shaking and moving dance floors across Toronto with his unique ability to mix and mash up different musical genres…. Dj Vicious did a tremendous job Deejaying our wedding reception. Everyone enjoyed themselves with the music selection. He was able to provide a great mix of different genres. He met often with us before the event to make sure all requirements were met and collaborated with the development of the itinerary for the evening. Dj Vicious comes highly recommended for various functions. Once again another amazing night thanks to DJ Babakahn. At my son’s Lohri party we had a blast and so did our guests. The dance floor was packed and didn’t empty till it was time to leave. They cater to all age groups which is amazing! Great job as always and we can’t wait till our next event that we host to have you as our DJ. Truly awesome guy to work with and a DJ who gives us more than what anyone can ask for. Keep up the great work! I just wanted to thank DJ Infiniti for the amazing job you did at my brother’s engagement this past weekend. Everyone kept asking who the deejay was and we got so many compliments on the music. Everything from the stage, lights to music was absolutely perfect! Would you like to speak to one of our team members over the phone? Just submit your details and we will be in touch shortly. You can also email us if you would prefer. Interested In contacting 808 Entertainment? Please fill out the contact form and a team member from 808 Entertainment will contact you.